Modern technology affords us the luxury of getting almost anything with the click of a mouse or the swipe of our finger. Many prefer to shop online due to the convenience and ease it allows. But as with most anything, there are unscrupulous individuals out to rob consumers of their money and entangle them in their web of online shopping scams. Here’s the catch: You’re online, scrolling through your Instagram feed, or checking the latest meme or story on Facebook when you spot an ad for the perfect gift. You click the link and view an offer that seems like a steal. The website appears legit enough and for the price offered—you just can’t pass up the deal. You load your cart while reaching for your bank card, excited already about your purchase. As you check out and receive notification that your order has been submitted, your excitement grows in anticipation of its arrival. A week or so later, with no update on the shipment or contact from the seller, you reach out to the only contact you can find, their online message form. You wait patiently, but all you receive is an automated message promising customer service will get back with you shortly. Surely there has to be a phone number to talk to someone, so you search the website, click the company’s social media page, and lastly, check Google for a number. No results for the number, but you do uncover several posts from others who, like you, have placed orders and received nothing but a charge to their account. Soon after, you are not even able to view the website and their social media page link delivers a “Sorry, this page cannot be found” message. It appears the offer was a steal, but not in a good way. You’re left wondering if you will ever get the item or your money back. Kim’s Advice: Rule number one, when you see an offer that appears too good to be true, use caution, because it probably is. Some scammers steal photos from other websites to pass off as their own, offering merchandise at steep discounts. In reality, what they send, if anything, is a poor knockoff of the advertised item, or nothing remotely close to what you’ve see in the ad. Sometimes the con can be revealed by simply doing a Google Image search. If the merchandise shows up on other sites that look more authentic at a higher price, this may be a clue that the deeply discounted offer is a ruse. With e-commerce websites like Shopify, anyone can create a website and post items for sale. Unfortunately, a lot of the scam sites are created on these types of platforms. It is advisable to check out the website thoroughly before placing your order, although you can report the website to Shopify if you’ve been conned. Look for contact information for the business, not just an email address. Check the terms and conditions for the company name, address, and phone number. If there is a phone number, call it to see if you are able to reach a live person. Take it a step further and check out the websites domain registration whois to see if the business provides their contact information. While checking, take note of when the website was created. There seems to be a high surge of fraudulent online seller websites that pop up around the holiday season. If the website is fairly new, you may want to give it some time before you place an order. Be aware that there are numerous online websites launched by international retailers. The sizes and quality of the products may be different than expected. For example, apparel coming from China may be considerably smaller than U.S. sizes. Pay attention to size charts and if you are unsure, call the business before ordering. If you cannot reach them, that’s a clue that you may not want to do business with them. Use a credit card to make the purchase whenever possible. Doing so allows the buyer certain protections against fraud. Even many debit card providers offer these types of protections. If you do not receive your order, or there is some other issue with the purchase, you may be able to file a dispute to recover your money. Always check out the reputation of the seller by getting a report from BCA and checking customer reviews. Be cautious of reviews presented on the business website. Search places such as BCA, Facebook, and YouTube for testimonials. BCA can help you assess if a company is reliable or not. Give them a call or send an email if you are considering making a purchase and are not sure about the credibility of the business. BCA can take a look at the offer, warn you of things that may cause concern, and provide helpful tips so you make an informed decision. And don’t forget to file a complaint if you’ve been scammed or have a problem with a business. I’ve found this handy shopping guide invaluable in helping determine if I want to make an online purchase. Check it out next time you’re ready to load that online cart. Business Consumer Alliance (BCA) is a non-profit company that started in 1928. The broad purpose of BCA is to promote business self-regulation. 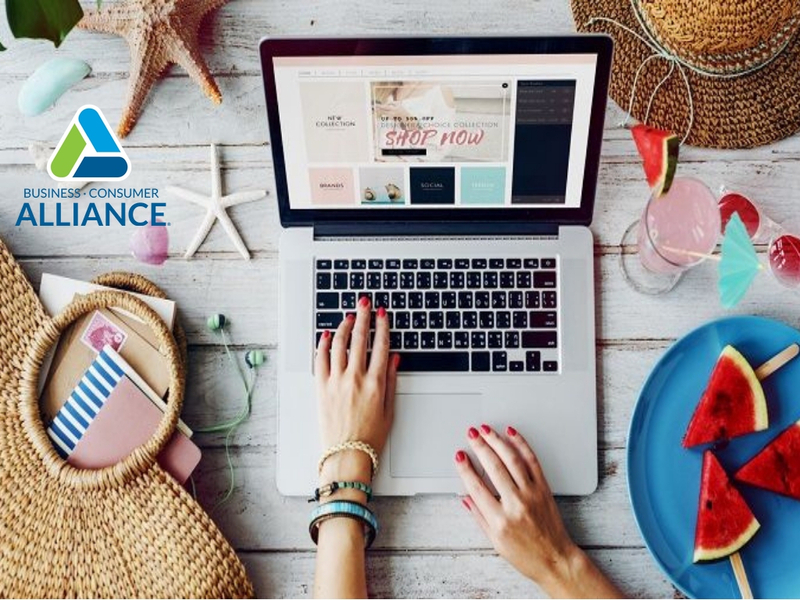 BCA's mission is achieved by assisting consumers in resolving complaints with businesses and using that complaint information, along with other relevant information such as customer reviews, to forecast business reliability. With community support, BCA can identify trustworthy and ethical businesses and warn the public to avoid unscrupulous businesses whose purpose is to defraud the marketplace. BCA also helps businesses promote themselves by providing services and tools to protect their business and reach out to their customers. BCA obtains its funding from member businesses who support the mission and purpose of the organization and who agree to abide by high standards of ethical business practices. Like what you see? Join the BCA Consumer Ally program. The Consumer Ally program is free for consumers to join. At BCA, we feel it's very important to educate the public on trends like scams, new laws and providing helpful tips to empower the public in making wise purchasing decisions. This program is an elite community of consumers who share our vision for a safe marketplace. We can't be everywhere at once so we depend on feedback from the public to help our efforts. Kim Burge is Business Consumer Alliance’s Vice President of Business Practices. She has over 22 years of experience at BCA, working in various departments. Kim has extensive knowledge with investigating the trends for a broad spectrum of business industries, evaluating business background information, and counseling companies to improve their business practices. She is insightful of consumer rights and assists government agencies and law enforcement with their investigations to protect consumers from fraudulent activity. For media inquiries, Kim may be reached by phone at (909) 835-6094.